Our understanding of community-level predictors of individual mental disorders in large urban areas of lower income countries is limited. In particular, the proportion of migrant, unemployed, and poorly educated residents in neighborhoods of these urban areas may characterize group contexts and shape residents’ health. Cross-sectional household interviews of 7251 adults were completed across 83 neighborhoods of Buenos Aires, Argentina; Medellín, Colombia; São Paulo, Brazil; Lima, Peru; and Mexico City, Mexico as part of the World Mental Health Survey Initiative. Past-year internalizing and externalizing mental disorders were assessed, and multilevel models were used. Living in neighborhoods with either an above-average or below-average proportion of migrants and highly educated residents was associated with lower odds of any internalizing disorder (for proportion migrants: OR 0.75, 95% CI 0.62–0.91 for the bottom tertile and OR 0.79, 95% CI 0.67–0.94 for the top tertile compared to the middle tertile; for proportion highly educated: OR 0.76, 95% CI 0.64–0.90 for the bottom tertile and OR 0.58, 95% CI 0.37–0.90 for the top tertile compared to the middle tertile). Living in neighborhoods with an above-average proportion of unemployed individuals was associated with higher odds of having any internalizing disorder (OR 1.49, 95% CI 1.14–1.95 for the top tertile compared to the middle tertile). The proportion of highly educated residents was associated with lower odds of externalizing disorder (OR 0.54, 95% CI 0.31–0.93 for the top tertile compared to the middle tertile). The associations of neighborhood-level migration, unemployment, and education with individual-level odds of mental disorders highlight the importance of community context for understanding the burden of mental disorders among residents of rapidly urbanizing global settings. The online version of this article ( https://doi.org/10.1007/s00127-018-1595-x) contains supplementary material, which is available to authorized users. This study was carried out in conjunction with the World Health Organization World Mental Health (WMH) Survey Initiative which is supported by the National Institute of Mental Health (NIMH; R01 MH070884), the John D. and Catherine T. MacArthur Foundation, the Pfizer Foundation, the US Public Health Service (R13-MH066849, R01-MH069864, and R01 DA016558), the Fogarty International Center (FIRCA R03-TW006481), the Pan American Health Organization, Eli Lilly and Company, Ortho-McNeil Pharmaceutical, GlaxoSmithKline, and Bristol-Myers Squibb. We thank the staff of the WMH Data Collection and Data Analysis Coordination Centers for assistance with instrumentation, fieldwork, and consultation on data analysis. None of the funders had any role in the design, analysis, interpretation of results, or preparation of this paper. A complete list of all within-country and cross-national WMH publications can be found at http://www.hcp.med.harvard.edu/wmh/. 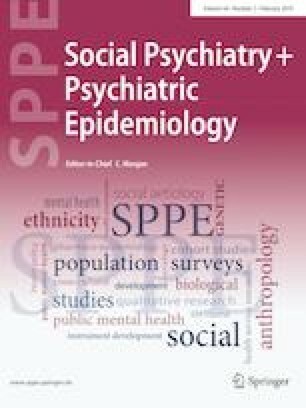 The Argentina survey—Estudio Argentino de Epidemiología en Salud Mental (EAESM)—was supported by a grant from the Argentinian Ministry of Health (Ministerio de Salud de la Nación). The São Paulo Megacity Mental Health Survey is supported by the State of São Paulo Research Foundation (FAPESP) Thematic Project Grant 03/00204-. The Mental Health Study Medellín—Colombia was carried out and supported jointly by the Center for Excellence on Research in Mental Health (CES University) and the Secretary of Health of Medellín. The Mexican National Comorbidity Survey (M-NCS) is supported by The National Institute of Psychiatry Ramon de la Fuente Muñiz (INPRFM/DIES 4280) and by the National Council on Science and Technology (CONACyT-G30544-H), with supplemental support from the PanAmerican Health Organization (PAHO). The Peruvian World Mental Health Study was funded by the National Institute of Health of the Ministry of Health of Peru. Dr. Laura Helena Andrade is supported by the Brazilian Council for Scientific and Technological Development (CNPq Grant # 307784/2016-9) and the State of São Paulo Research Foundation (FAPESP; Project Saúde mental, migração e São Paulo Megacity—M3SP; Grant16/50307-3). In the past 3 years, Dr. Kessler received support for his epidemiological studies from Sanofi Aventis; was a consultant for Johnson & Johnson Wellness and Prevention, Sage Pharmaceuticals, Shire, Takeda; and served on an advisory board for the Johnson & Johnson Services Inc. Lake Nona Life Project. Kessler is a co-owner of DataStat, Inc., a market research firm that carries out healthcare research. Other authors have no financial or personal conflicts of interest to disclose.